Abner Clift and Mary Robinson are Todd’s 4X Great Grandparents. Abner Clift was born about 1791 in Virginia. His parents are said to be Benjamin Clift and Frances Peak. Mary Robinson was born in about 1790 in Virginia. Her parents are said to be George & Dinah Robinson. Photo: Mary Robinson Clift, from her Find A Grave memorial, used with permission. Abner Clift and Mary Robinson were married on December 21, 1811 in Mason County, Kentucky. On the 1820 US Census, Abner was head of a household of 5: 1 male under age 10 (unknown); 1 male aged 26-44 (Abner was 29); 1 female under age 10 (America was 6); 1 female aged 16-25 (Mary was 30); 1 female aged 45 and over (unknown). The family had no slaves. On the 1830 US Census, Abner was head of a household in Mason County, Kentucky, and there were 13 including 5 slaves: 1 male aged 10-14 (Franklin was 3); 1 male aged 40-49 (Abner was 39); 2 females under age 5 (unknown); 1 female aged 5-9 (Lamira was 5); 1 female aged 10-14 (America was 16); 2 females aged 30-39 (Mary was 40, unknown); 2 male slaves under age 10; 1 male slave aged 10-23; 1 female slave under age 10; 1 female slave aged 10-23. On the 1840 US Census, Abner’s household totaled 19 including 8 slaves: 1 male aged 10-14 (Franklin was 13); 2 male aged 15-19 (unknown); 1 male aged 40-49 (Abner was 49); 2 females aged 10-14 (unknown); 1 female aged 15-19 (Lamira was 15); 1 female aged 20-29 (America was 26); 1 female aged 40-49 (unknown); 1 female aged 50-59 (Mary was 50); 2 male slaves under age 10; 2 male slaves aged 10-23; 1 male slave aged 24-35; 1 female slave under age 10; 1 female slave aged 10-23; 1 female slave aged 24-35. Abner is said to have died in 1847. 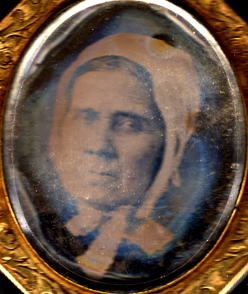 On the 1850 US Census, Mary was widowed and 61 years old. Three of her children were at home: Lamira was 23; Ann was 21; Franklin was 23. Mary Clift is listed on a Slave Schedule as having the following slaves: 1 male age 37; 1 male age 24; 1 female age 24; 1 male age 15; 1 female age 8; 1 female age 2. On the 1860 US Census, Mary was 70 and lived in Mason County, Kentucky with daughter Lamira Clift Hickman, her husband George, and their children. Mary Clift is listed on a Slave Schedule as having the following slaves: 1 female age 38; 1 male age 16; 1 female age 8; 1 male age 4; 1 male age 2. George and Lamira are Todd’s 3x Great Grandparents, and they moved to Holt County, Missouri after the Civil War. Mary moved to Henry County, Indiana to live with daugther America Clift Peed, her husband and children. Mary died there on September 27, 1868. Her Find A Grave memorial is here. I believe her birth year to be incorrect on the memorial. America Clift – America was born about 1814 in Kentucky. She married the widowed Richard Peed and they had 4 children. She died June 14, 1884 in Henry County, Indiana. Her Find A Grave memorial is here. Photo: America Clift Peed, from her Find A Grave memorial, used with permission. Lamira Clift – Lamira is Todd’s 3x Great Grandmother. Read about her here. Benjamin Franklin Clift – Franklin was born in September of 1826 in Kentucky. He married Ann G. Clift on January 15, 1851 in Mason County, Kentucky. They had 3 children. After the Civil War, they lived in Henry County, Indiana. He died on April 8, 1920 in Henry County, Indiana. His Find A Grave memorial is here. Note: I suspect Ann & Franklin were cousins. They are listed on the 1850 US Census living with Franklin’s mother and sister, and all share the same last name, so they appear to be siblings. However, there is a marriage record for them. On the 1850 US Census (late August 1850) and the marriage record (mid January 1851), she is listed as “Ann G. Clift” and her birth year stays fairly consistent through all Census. To further confuse things, Benjamin has a cousin named Benjamin Franklin Clift, born 8 years after him. By the 1860 US Census, both are married, living right by each other in Mason County, Kentucky, and both have sons named Wyatt. On the 1860 Slave Schedule, Benjamin F. Clift is listed with 7 slaves (a female aged 37, and boys aged 10, 8, 6, 3, 2, and 6 months), but I don’t know which Benjamin this is. This entry was posted in Hickman Family History and tagged Abner Clift, America Clift Peed, Ann G. Clift Clift, Franklin Clift, Lamira Clift Hickman, Mary Robinson Clift, Richard Peed by fillinginthefamilytree.com. Bookmark the permalink.